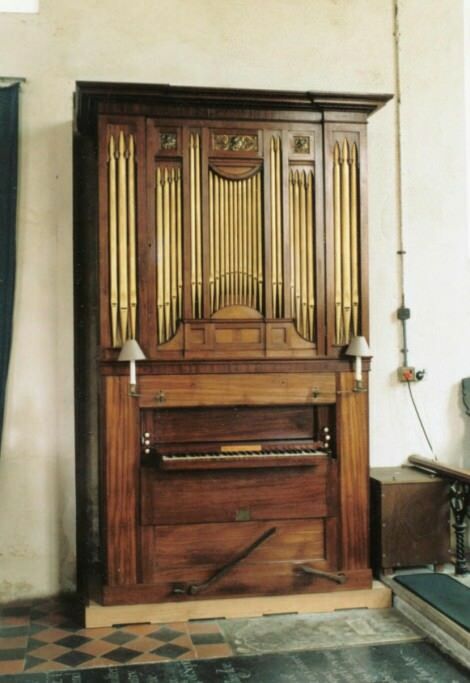 The organ was made by ‘Thos Elliot/ Tottenham Court London/ 1812’. The organ evidently came to Thornage from Swanton Novers Hall, and was sold to the church for £14 (source?). Under the treble end of the keyboard cover is written: this Organ was rebuilt for L Atkin Esq/ Swinton Novers by EWPaulett of/ Norwich/ June 3rd 1904. The organ was restored by Boggis of Diss in 1945. In 2002 Edward Bennett and Chritina Reinspach restored this organ, treating for woodworm, replacing corroded pulldown wires, repairing wind leaks and regulating the action and voicing. Stuart Dobbs restored the metal pipes, and particularly the Hautboy, which had been replaced and was found stored on the roof of the organ and elsewhere in the church. The voicing of the Hautboy was restored by Martin Goetze. The case was repaired by Verners Kalacis, and the surface finish touched in and revived by Charles Marsden. The key compass is GG AA to f³ (58 notes). The pitch is A441Hz at 18C, and the tuning used was modified meantone (the 1945 tuning sldies were retained). The wind pressure was surprisingly low at 46mm w.p. and the voicing gentle. All the pipes stand in the swell box. The pedal at the treble end operates a sliding swell front (with a rope with two pulley wheels, not a nag’s head). In the centre of the plinth there is a blowing pedal, no doubt for the convenience of practicing, since there is also a blowing handle at the side. At the bass end there is a shifting movement pedal, which reduces to Open and Stop Diapasons and Hautboy. The sliders are held open at the chest with steel springs. There are notches in the stop shanks so that they are held in the jamb in the off position, when the knob is flipped up they shoot out. Pressing the shifting movement pedal down moves the Principal and Fifteenth sliders off, and the springs move them out when the pedal is let go.